Join the fun aboard a 54-foot luxury Sailing Catamaran! Join the friendly and experienced crew of this gorgeous 54 ft. Catamaran. With lots of fun activities planned for the day-from island history, games, limbo competitions to music and dance. Our snorkel stop might be one of four top St Maarten snorkeling locations and is determined by sea and weather conditions. You might see Divi Reef(Little Bay), Long Bay(La Samanna), Simpson Bay ship wreck or Cay Bay, all of which are flush with marine life. Snorkel through waters hued with turquoise as you explore coral reefs teeming with life. Eat a snack, dance to Caribbean music and bask in the sun or slide down the catamaran's water slide into the crystal clear Caribbean waters. For the beach stop, we usually go to Long Bay (La Samanna), Mullet Bay beach, Maho beach, or Karakter beach. You will find white sand beaches at any of these locations, so dig your toes in! 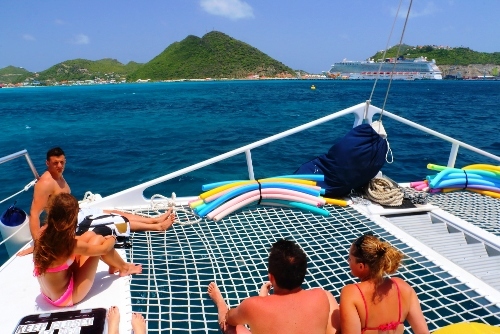 On the return sail to Philipsburg , relax in the sun or shade, sip drinks from the open bar or dance to the perfect ending to your happy day in this little paradise island of St. Maarten. 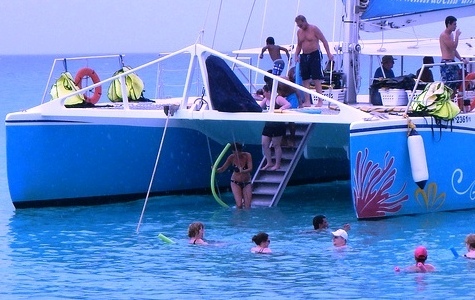 Catamaran tour fills quickly..book early to guarantee space! • Open bar: rum punch, fruit punch, soda, water, beer, juice, and "Cuba Libre" cocktails. • No taxi required. 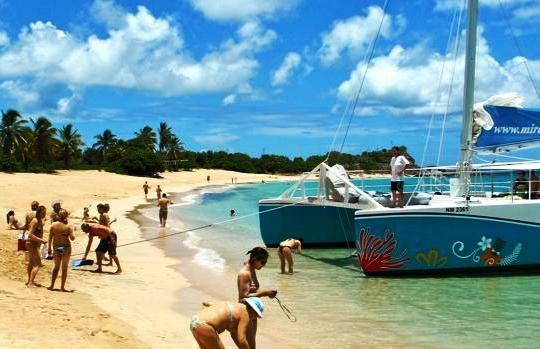 The meeting location for this Catamaran Sail Snorkel & Beach tour is within walking distance of St. Maarten cruise pier. • Guests must be able to walk into the water to access beach. • Snorkeling visibility and presence of marine life not guaranteed. • Alcohol will only be served after all water activities are finished. Online booking was easy. Catamaran staff were friendly and made sure eveyone was safe. Great snacks and rum punch, beer was ok. Most important, we made it back to ship with plenty of time. nice job. Our kids really enjoyed this tour. Guides were very conscious of safety while snorkeling. The Catamaran was clean and well maintained. Catamaran staff was professional. Snorkel stop was good..have seen better. We stoped at a very nice beach where we swam for about an hour. The ride back was fun with music, rum punch, sandwiches. All in all, a very nice excursion for the money.